Where the roof meets at an angle, the point at which the two sides meet is called the hip. Casey’s stock a wide range of hip tiles, from traditional mortar fixed clay ridge tiles to Dry Fix Systems. Meets latest building regulations and helps combat condensation and the need for future maintenance. The Dry Hip System provides a neat and attractive finish to the hip line without the use of mortar. The hip tiles are secured to the appropriate size hip batten, using stainless steel wood screws which give exceptional resistance to wind uplift. The system may be fixed in all weathers and is maintenance-free. The components that make up the Dry Hip System comply with BS EN 490: 1994 and BS 5534: 2003. 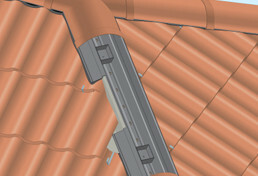 Plain Angle Ridge Tiles are available in three angles in concrete (85°, 120° and 140°). Colours available are Slate Grey, Terracotta, Tudor Brown and Black.